Most Disney Resorts have lounges somewhere, and Mizner’s Lounge is the spot for the Grand Floridian Resort. It’s sometimes confused with the Tea Room downstairs, but Mizner’s is behind the bandstand on the "second floor" (i.e. it’s the same level that you will find the Monorails on, but at the other end of the main building). As with most lounges, there’s a wide variety of "adult" beverages available along with some resort-themed specific classic cocktails like Manhattans and Side Cars. 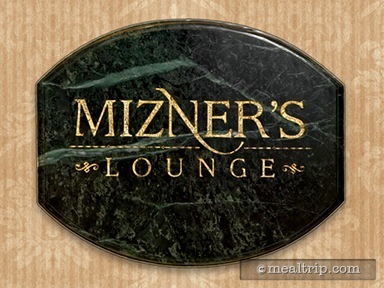 There is also an appetizer, entree, and dessert menu available from around 5:00pm (times may vary) until 10:00pm that contains a few very interesting items (for a lounge) in part thanks to the close proximity of Mizner’s Lounge to Citricos (hint, most of the items are "very" similar).